Grease a square baking dish and add a layer of potatoes. Season with salt, pepper and anise. Add a layer of cheese and strips of red pepper. Repeat until you finish with a layer of potatoes. Whip the eggs in a bowl, add the milk and a bit of salt and pepper. Pour this mixture over the potatoes and bake for 45 minutes or until the top appears fully cooked and browned. Remove the potatoes from the oven and let sit for 10 minutes before cutting. You can use different types of peppers to give your dish a personal touch. If you can’t find queso fresco or Andean cheese, use any cheese you like. Arequipa is the second most important city in Peru. It’s also the birthplace of a cuisine made famous by its intense flavors and for the variety of its dishes. The rocoto relleno (stuffed pepper) is one of the clearest examples of this culinary flavor, always served with the famous potato gratin. The original recipe is made with strips of rocoto instead of pepper, but we like to make it without super spicy ají and leave the rest of the flavors intact. For this, anise is very important, as is the queso fresco. Try to find Andean cheese, otherwise any cheese that will soften in the oven without melting works too. 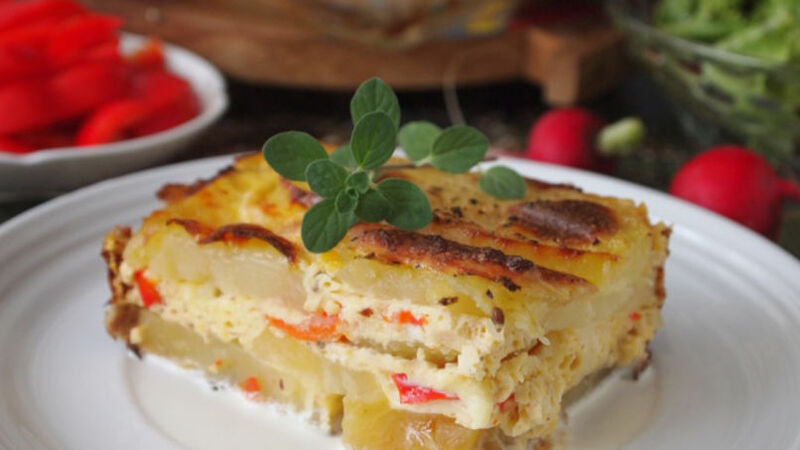 Potato gratin is the perfect side for meats or stuffed peppers. You can also serve it with a green salad for a light lunch. This dish is a great addition to a buffet table because it can be served easily and made in advance.